Regional Distributor for Richlite paper-based fiber composite materials. The Cascade Mountain Range is the quintessential backdrop of the Pacific Northwest and the inspiration for Richlite Company’s line of layered products. Rainier, Shasta, Adams, Hood, Little Tahoma and Baker are the six tallest peaks and represent Richlite’s Cascade Range. Click here to learn more. Note that images of materials below are a close representation of color and texture, actual product color and texture may vary. If interested in placing a production order please (contact us). Customizable, Richlite’s Cascade comes in six color variations featuring multi-color edges for progressive design tastes. If the six tallest peaks in the Cascades aren’t your style, add your own look and feel with customized layering. The linear design of the Cascade Range allows for interesting edges that match coordinating Richlite sheets. Custom combinations and thicknesses may be ordered. Cascade can also be used for signage when the product is machined into to reveal contrasting colors. The linear design of the Cascade Range allows for interesting edges that match coordinating colors from the Northwest Collection in custom combinations and thicknesses. To ensure balance, the top and bottom (horizontally) must mirror each other from the centerline out and the thinnest individual layer may be no thinner than 1/32″. For help customizing your layered design, contact us. Richlite has a “mottled” appearance, which patterns in a striated effect lengthwise. This is less apparent, but present on dark colors, including Black Diamond. This quality is due to the natural variation in the way fibers lay within the paper used to make the material. Richlite Authorized Fabricators can shape extravagant edges and route artistic features like drain channels directly in the material. Faux edges hide the true thickness of many stone and solid surface products. Richlite is designed to look beautiful without a built up edge, however for those areas that cannot bear the added weight we specifically designed Little Tahoma and Baker with half-thick stripes on the top and bottom of each panel especially for built-up edges. Richlite can produce clean seams. They’re not invisible but much cleaner than what can be achieved through stone countertops. Seams will look similar to those of wood or veneers. Seams should be displayed where they make design sense. Consider the impact of the striations when determining seam placement. Richlite comes in up to 12-foot lengths and five-foot widths so most projects can be accomplished without a seam due to the size of the sheet. Richlite’s Cascade Range reflect the colors and personalities of the company’s home in America’s mountainous and forested Pacific Northwest, and give designers a creative alternative with solid-color tops with two- to three-tone edges. The multi-color paper composite surfaces blend the best of the natural and design worlds with subtle accents that enliven kitchens, baths and commercial environments. Cascade’s unique layering system allows for contrasting signage when engraved and unique edges. The material is dense and durable with comparable features to solid surfaces and stone; including stain, heat and scratch resistance, sanitary benefits and long cantilevers and spans. The linear design of the Cascade Range allows for interesting edges that match coordinating Richlite sheets. Custom combinations and thicknesses may be ordered. Generally speaking, Richlite resists stains quite well. As with most material, there is potential for some staining. Richlite stands up well to anything acidic, but high-alkaline products may pull or alter color after prolonged exposure. Stains may be cleaned with soap and warm water and scrubbed with a soft bristle brush. More stubborn stains may be repaired by a light refinishing of the material. Visit Care + Maintenance for further information. It’s significantly harder than wood but, like most countertop materials, can, under force, be scratched or gouged. Richlite countertops should not be used as a cutting surface. Because Richlite is a solid color throughout, when scratches do occur, they can easily be buffed or sanded out. Use of a separate Richlite cutting board is recommended. Most cuts, scratches and nicks can be repaired with a light refinishing. Visit Care + Maintenance for further information. Richlite is heat resistant up to 350º F. Due to its high heat resistance, the material does not need additional protection near stove areas though a trivet or hot pad is recommended to ensure no damage will be caused by exceedingly hot pots and pans pulled directly out of the oven. Visit Care + Maintenance for further information. Richlite is an incredibly durable product, but it can scratch. Scratches will eventually patina and are typically superficial. Due to its high impact resistance, gouges or cracks are uncommon. Because of the way it is manufactured with stacked sheets of paper, the edge can be prone to chipping if not eased or radiused properly. Over time and with use, Richlite will develop a seasoned appearance that is characteristic of the material. There will be more luster or burnishing in areas of heavier use. Overall it will appear softer and deeper in color and pattern. Aging is a natural process that begins immediately and may take a number of years to complete. It is similar to the manner in which natural wood products oxidize and age over time. The speed of aging will be affected by the amount of natural light the product is exposed to. Typically the process is noticeable after one to three months. In general, color change is least noticeable in darker colors and more pronounced in lighter colors. The manufacturing process does not allow absolute control over the color of the final product. Slight variations between sheets may occur but will lessen as they age. The effect of aging in Richlite is primarily a result of the resin component, which begins as pale amber and deepens to a rich shade of sienna. It is strongly recommended to view this color change prior to purchase. Richlite is recognized for its sanitary performance appreciated by chefs in the home and in high profile commercial kitchens. The National Sanitation Foundation, which sets standards for food service-related products has certified Richlite Natural for use as cutting boards with direct food contact in restaurants. The same material is used in Richlite countertops. The surface is impervious and does not support the colonization of bacteria. View Richlite’s NSF Listing. Due to the long, tough fibers inside Richlite, the material will not bend or break under normal circumstances. As a result architects and designers love the ability to design long spans and extended cantilevers without additional support. As a rule of thumb, 3/4”-thick material is structurally stable with a 12” overhang, 1”-thick material is stable up to an 18” overhang, and 1 1/2”-thick is stable up to 24″. All Richlite materials, including the Cascade collection, are made with either FSC Certified or post-consumer recycled paper. In addition, Richlite products are GREENGUARD certified for indoor use in residential, school and institutional environments and can contribute to LEED points. Cascade finishes much like Richlite Northwest while maintaining unique edge details and the ability to engrave into contrasting colors. Richlite looks natural, is non-porous and has a matte finish. 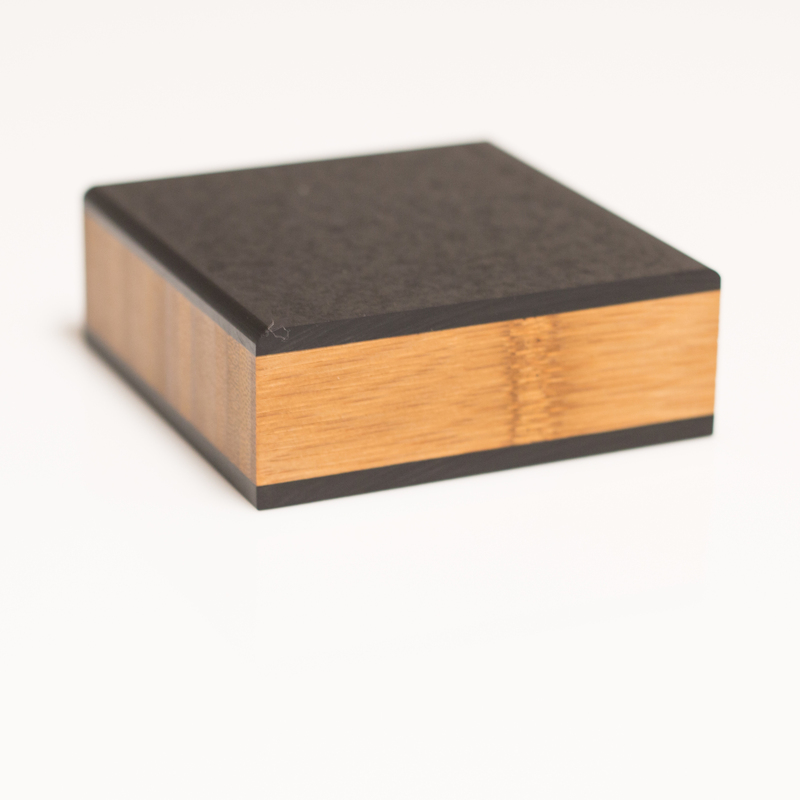 The surface of the manufacturer provided samples has been sanded, buffed and sealed with two coats of finish. Richlite does not maintain a polished or highly sanded surface. This finish is recommended by the manufacturer as the best balance for initial look and feel and eventual wear and patina. We do recommend putting a finish on the surface, however, if one desires not to apply a finish the integrity of the material will not be compromised. The surface, however, will start to appear “chalky” and will also pick up oils from fingerprints, food, etc. Mineral oil brings out a deep luster, however, requires more maintenance. Because Richlite material is non-porous the oil has a difficult time penetrating the surface. Water marks may appear from glasses and tableware as oil and water do not mix. If you are using soap and water to clean your countertops be aware the soap will expedite the removal of oil and the countertops will start to appear chalky. Wood Counter Finish from Bioshield is a great eco-friendly choice. The finish is oil-based with a hardener mixed in so it stays on the surface much longer and will not be removed with soap and water. It also acts as a better repellent to water marks, stains, etc. This is the preferred finish for residential use as it has low VOCs. Richlite Color Enhancer is the most maintenance free finish, but it will require some maintenance. It is recommended for larger commercial projects and can be applied easily in the field. Cascade Shasta and Rainier is available in 1 or 1 1/4 inch thick. 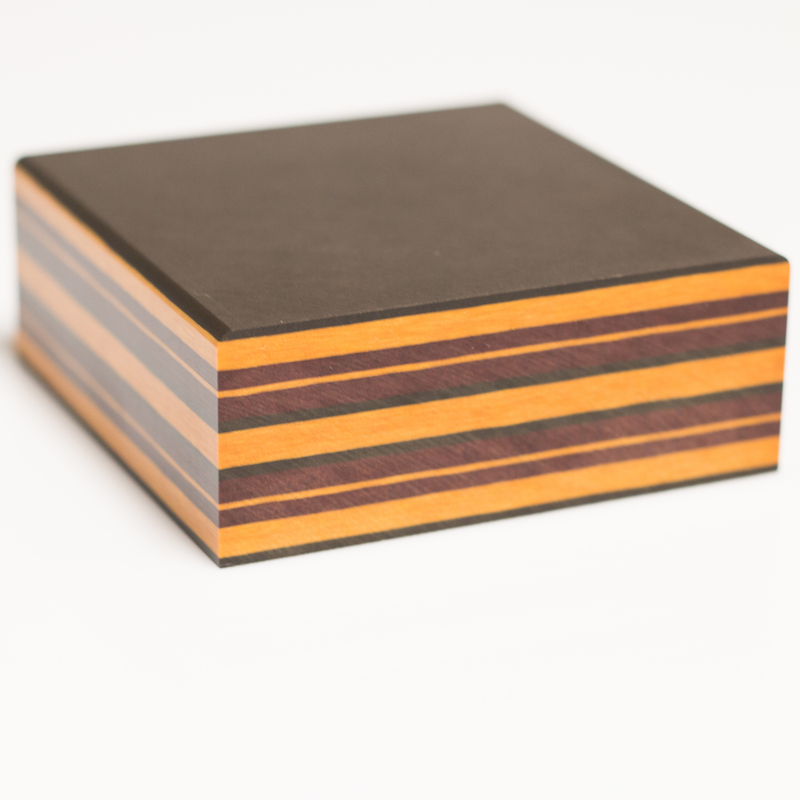 Cascade Little Tahoma and Baker is available in 1/2 inch thick. Cascade Hood and Adams is available in 1 inch thick. With something as unique as Richlite, you’re bound to have questions. Answers to questions relating to performance, design, environmental and technical aspects of Richlite’s paper composite surfaces are found below. If you can’t find the answer here, Contact Us for further information. Is Richlite a solid surface? By the technical definition of solid surface, NO. Most solid surface materials combine two main ingredients: a natural mineral (the “filler”) and a resin (the “binder”), along with various additives. These are combined and then formed in a curing process that results in a sheet or a shape. All that being said, some people have grouped Richlite within the solid surface category because of the solid color through the material. If you cut it in half you’d find the same surface on the inside as you started with on the outside. If that’s not a solid surface, what is? But it’s not a poured plastic with fillers like most of the other products that call themselves solid surfaces. And it’s not a kind of laminated sandwich where a nice topskin is glued to a cheaper substrate. Richlite is truly in a class of its own. Richlite is extremely durable. Remember it’s been used for industrial and marine purposes and as a skatepark surface for years. The kitchen is the Richlite’s least challenging environment. How stain resistant is it? Your countertop is stain resistant to most all kitchen related substances with the exception of some raw meat juice (such as liver), high-alkaline fruit or vegetables (such as papaya and red beet), and high-alkaline soaps (such as automatic dishwasher powder) when left in contact for a prolonged time. How does it do with heat? Richlite is heat resistant up to 350°F. A pot of boiling water won’t affect the look of the surface though a red hot pan under extreme temperatures will discolor the material. Hot pads are recommended to prevent scorching. Since Richlite is made out of paper will it darken over time? The composition of Richlite Surface is cellulose fiber and resin, much like Mother Nature’s trees (but with extra resin in our product to make it more durable). And similar to certain characteristics of wood, Richlite Surface r100 material does noticeably darken with age due to ultra-violet exposure and oxidation, much like Fir or Cherry cabinet material. It is this enriching color transformation that has many architects praising the look of the r100 color. The Browns Point, Black Diamond, Green Mountain, Redstone and Blue Canyon do not display such a change because of their darker base colors. Of course, color evolutions can be restrained by employing ultra violet shields upon incoming natural light. How scratch resistant is Richlite? It’s significantly harder than wood but, like most countertop materials, can, under force, be scratched or gouged. Richlite countertops should not be used as a cutting surface. Because Richlite is a solid color all the way through, when scratches do occur, there will be no difference in color – unlike many solid surfaces where the scratch appears as a different color than the material. Use of a separate Richlite cutting board is recommended. Most cuts, scratches and nicks can be repaired with a light refinishing. Is the material food safe? Yes. Richlite does not support the colonization of bacteria and is food safe. Richlite cutting boards are certified by the National Sanitation Foundation for use with direct food contact in restaurants. The NSF sets standards and certifies food service related products for the industry. The same material is used in Richlite countertops. View Richlite’s NSF Listing for more information. Does Richlite work best with a particular design style? Richlite has been specified by architects for a variety of projects from modern buildings to country kitchens and Asian-influenced designs. Can undermounted sinks be installed with Richlite? Yes, undermounted sinks are an attractive and popular design choice for Richlite customers. What is Richlite made out of? Richlite specializes in the manufacture of natural fiber composites. 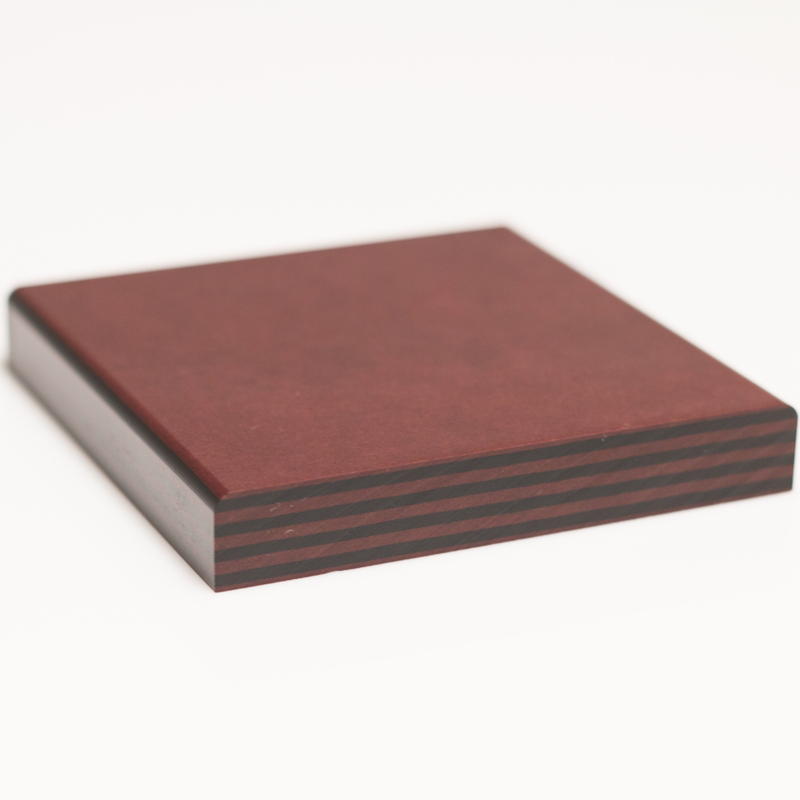 Richlite is primarily paper treated with phenolic resin and baked to create a solid sheet. During the production cycle the layers of paper are gradually crossed-linked with each other to create solid, durable sheets. Once the curing process is complete, the structure of the product is permanent and cannot be altered. The final product is exceptionally strong and still maintains a warm and natural look. For more information see Richlite’s technical composition. Where does Richlite paper come from? Richlite paper comes from pulp that is derived from trees, which is produced from paper purchased from FSC® Certified sources and/or recycled paper. Does Richlite use recycled paper? Yes, Richlite offers products that contain recycled content; r50 contains 50% old corrugated cardboard (post-consumer waste) while r100 is made with 100% recycled paper (post-consumer waste) and is FSC® Certified 100% Recycled. What type of paper is used? 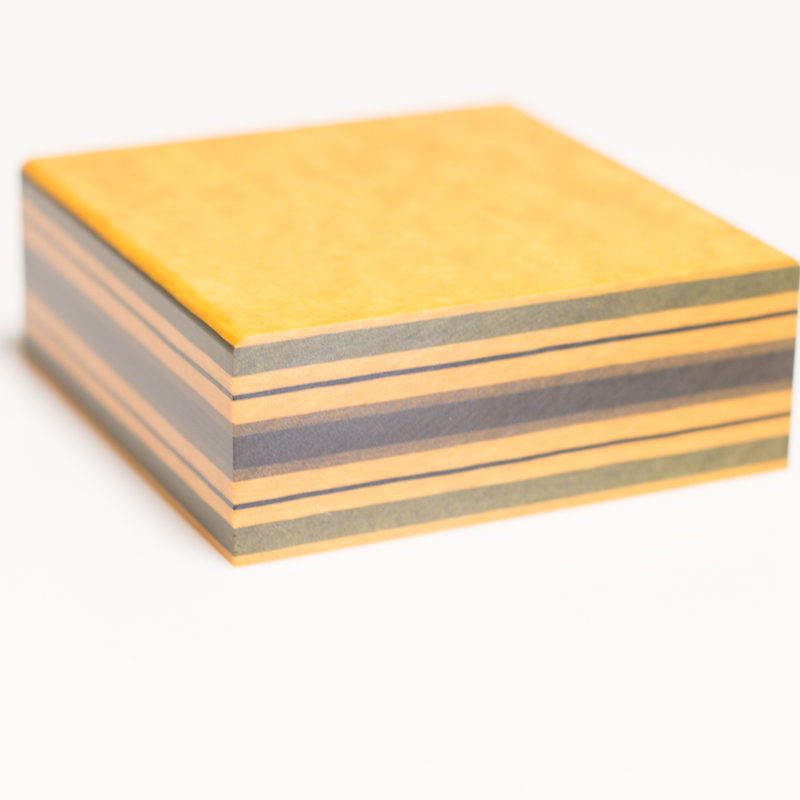 We use a specially-formulated custom paper specified for color and strength capabilities. Is it considered a “green” product? Yes. Richlite is classified green in large part because the predominate raw material is derived from renewable or recycled resources. Managed and sustainable forests, habitat conservation efforts, and prudent manufacturing practices are just some of the environmental mandates that go into our product. We use the most environmentally benign production methods and materials available. During the saturation and drying process, over 99% of the volatile organic compounds are incinerated. The heat from that incineration is used for the drying process to minimize thermal pollution. There is no hazardous waste generated in our process. Visit WE Tech™ for further information on our innovative manufacturing system. No. Richlite does not off-gas because the compounds inside it chemically cross-link during the manufacturing process and are locked into the solid surface creating a homogenous material. For more technical information on off-gassing, and to view Richlite’s GREENGUARD Certificates, visit GREENGUARD.org. Developed by USGBC, Leadership in Energy and Environmental Design (LEED®) is a rating system designed for evaluating a building’s environmental performance. The LEED system has been widely adopted for rating new and existing commercial, institutional, and high-rise residential buildings. Can Richlite be specified for LEED projects? Richlite products can contribute to LEED building certification guidelines for third-party certified rapidly renewable, recycled content, regional, and low-emitting materials. What type of fire rating does it have? What is the specific gravity of Richlite? The specific gravity is 1.213, which means that Richlite is 21% heavier than water by volume. How dense is the material? The density of Richlite is 75.84 pounds per cubic foot or .0439 pounds per cubic inch. View Richlite Properties. 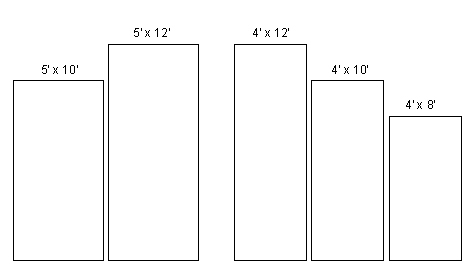 How far can the material cantilever or span? Designers love Richlite because of its long span and cantilever capabilities. Yes. It’s completely safe. In tech-speak Richlite is inert due to the complete crosslinking of reactants or free radicals. In fact, the most common use of Richlite product has been for National Sanitation Foundation-approved cutting boards in restaurants. What are the VOC emission levels? Particulate emissions at our manufacturing facility are subject to control devices that operate at 99% efficiency. Volatile Organic Compound (VOC) emissions are virtually eliminated through state-of-the-art equipment that maintains a very high destruction of particulate matter. There is no hazardous waste generated in our process. Best Available Control Technology (BACT) is the standard to which Richlite manufactures all of its products. VOC concentration levels from our manufacturing process are held within acceptable limits set forth by Washington State regulated emission standards. In fact, BACT standards for VOC control has an established minimum destruction efficiency of 95%; while Richlite manufacturing emissions are controlled at a higher destruction efficiency of up to 99.9%. What is the technical composition of Richlite? 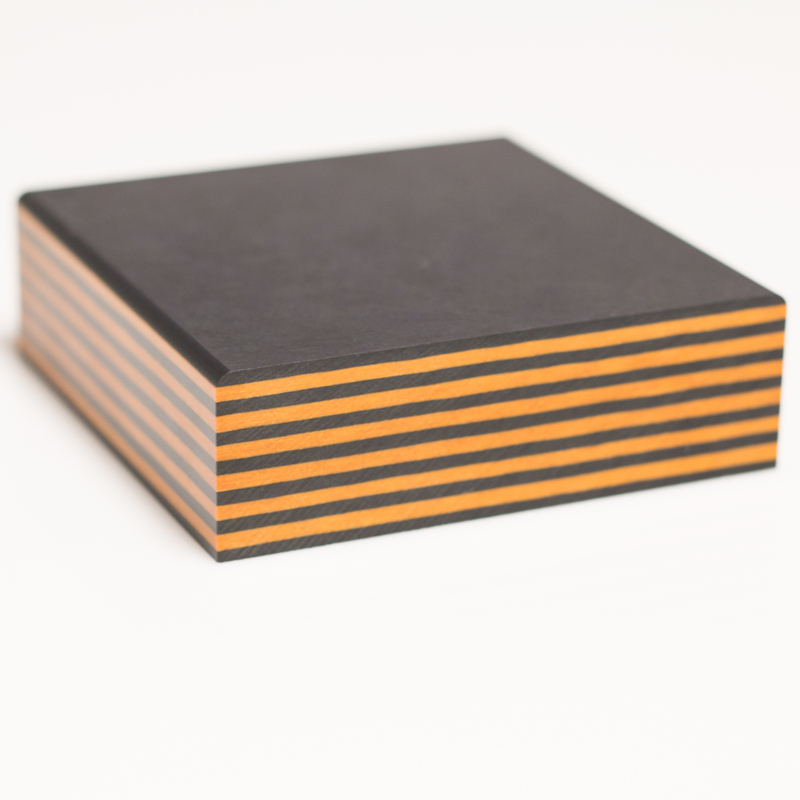 Richlite paper composite surfaces are comprised of cellulose fiber and phenolic resin. Cellulose, a polymer material fundamental to all natural plants, is derived through pulping, the initial ingredient stage in the manufacturing process of paper. 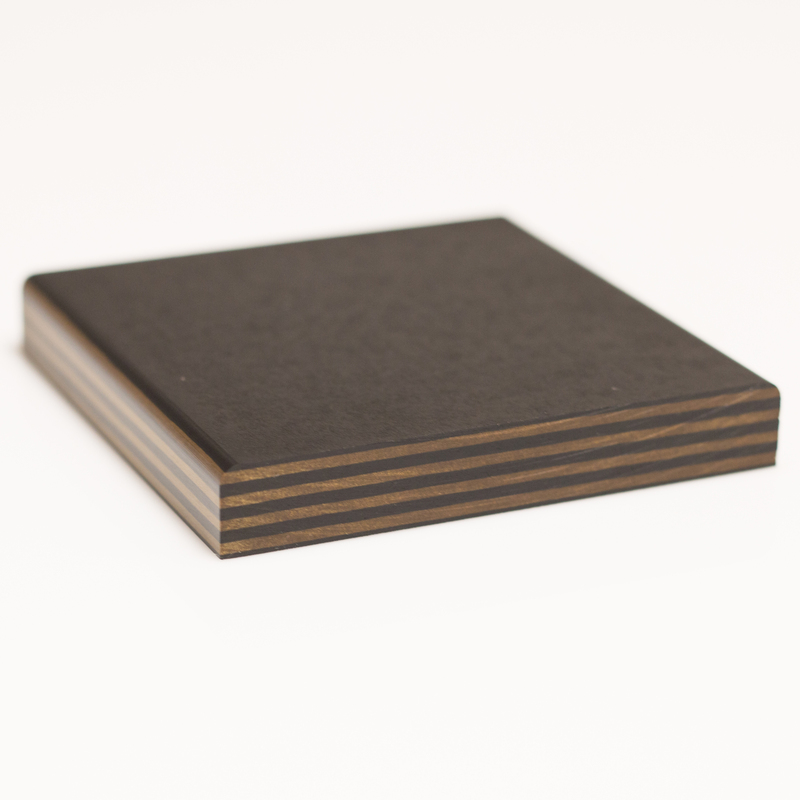 Richlite incorporates wood-sourced cellulose fiber derived from paper purchased from FSC® Certified sources and/or recycled paper. View a detailed break down of Richlite’s Composition. Phenolic resin is a thermosetting bonding compound produced by polymerizing C6H5OH and HCHO. During a controlled thermosetting process, the molecules in the resin crosslink with one another to form an inert, solid and highly stable material composite.